We are a small, family owned business that prides itself on high quality work. We treat each animal as if it were our own from the moment it is received to the moment it is picked up. Our system ensures your name will follow your animal throughout the entire process of cutting, grinding, wrapping, and freezing to ensure your meat is returned to you. Click this link to view the meat processing guidelines and pricing brochure. For over nine years, the Rocky Mountain General Store has supplied locals with fine meats and groceries year round. One can catch up on the local news in the Valley by chatting with Jim and drinking premium coffee at half price from 7am to 8am. Jim and his team process their own meats for the grocery store, creating delicious brats, steaks, beef, pork, and elk varieties of sausage, summer sausages, and the list goes on and on. The deli is open in the summers and provides fine cheeses, sandwiches, and cold cuts. All of your daily needs can be met without going to town as we carry a full line of groceries including foods, batteries, toiletries, fishing tackle, pet food, movies, household supplies, and much more. 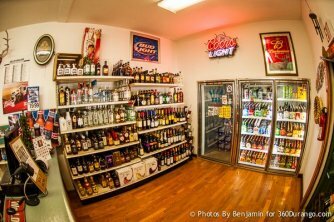 We carry a tasteful selection of wines, spirits, and beers. We stock locally produced liquors, beers, and wines from well-known brands such as Colorado Honeyville Whiskey, Ska beers, and Sutcliffe Vineyards wines. You'll also find staple brands such from Budweiser to Coors, Jack Daniels to Grey Goose, and Yellowtail to Barefoot. Across the street our business has self-storage units available for rent. Contact Jim for details.